This is by far one of my favorite dishes for brunch... and I say brunch because you can enjoy it at either breakfast or lunch. As a new mom, this is also the dish that makes me feel most put-together– it's luxurious, balanced, and powerful start to your day! Best of all, it takes about 3min to prepare. I've remade this recipe at least 3x since having Winnie & will usually freeze 6-8 bowls at a time. Prepare quinoa and sweet potato in advance. For quinoa cook plain, 1 to 1 ration of quinoa to water. For sweet potatoes wash and cut into 1inch wedges– bake plain. 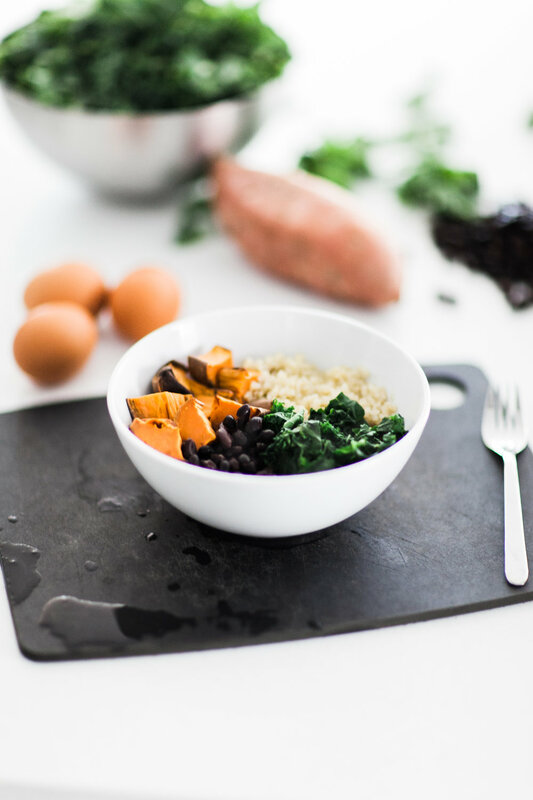 Dish up kale, quinoa, sweet potatoes (diced), and black beans. To store for later, use quart sized freezer Ziploc & leave some air in the bag– do not pack down. When ready to enjoy, microwave for approx 2min from frozen. In small nonstick pan, fry two whole eggs– I highly recommend pasture raised! Serve over easy for that runny yolk, top with salt, pepper, and hot sauce (optional). Enjoy!